Once upon a time, there was an siRNA screen for 70 cellular genes that regulate nucleocytoplasmic transport. The screen was done to find genes needed for flu entry, since flu replicates inside the nucleus. Of the hits, nuclear import factors were examined in detail, one of which was transportin 1 (TNPO1), an importin β family protein. TNPO1’s function is to nuclear import cellular ribonucleoproteins (e.g. hnRNP A1) and RNA-binding proteins (e.g. FUS) by recognising a PY-NLS sequence on these cargos. ​Our study found that TNPO1 is needed for vRNP debundling during cell entry of flu. 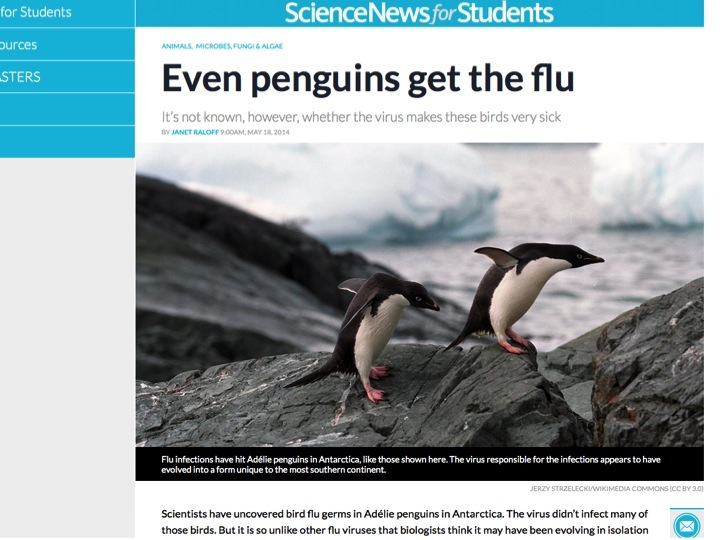 Even penguins get the flu - it's not known, however, whether the virus makes these birds very sick....After I read this article in Science News for Students, I decided to use a waddle of eight penguins to depict incoming flu vRNPs. A group of penguins on land are called a 'waddle', those in water are called a 'raft'. 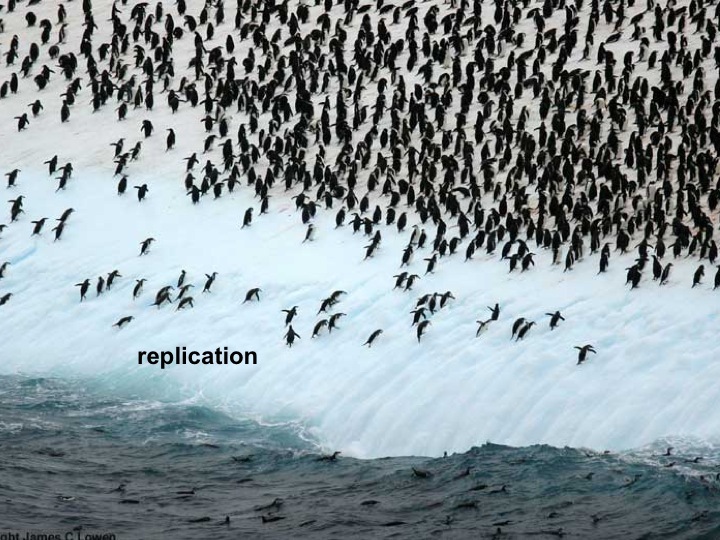 I used the analogy in the summer of 2015, at the IMLS retreat of University of Zurich to a largely non-expert audience made of developmental biologists, molecular biologists, and proteomists. After a few slides, the oohings and ahhings I heard from the audience indicated I made a good choice. Influenza virus is a member of the Orthomyxoviridae family. It is an enveloped, single-stranded negative-strand RNA virus with eight vRNPs protected within a M1 matrix shell. Each vRNP consists of oligomeric nucleoprotein (NP), viral RNA, and viral polymerase. vRNPs are up to 110 nm in length and packaged in an ordered fashion inside the M1 shell, adopting a 7+1 arrangement with seven vRNPs surrounding a central vRNP. Have you ever been injured only to find how easy it was to move your body before the injury? There is a revelation that a part of your body existed! In normal cells viral uncoating happens seamlessly, like a fit runner or well-oiled machine. When the left kneecap or a gear is destroyed, the runner will stumble and the machine will stop. Our lab takes a similar approach to study the effect of cellular deprivation on virus entry. We use CRISPR/Cas or siRNA to deprive the cell of an essential-for-the-virus cellular function and observe the detrimental effects it has on an incoming virus. 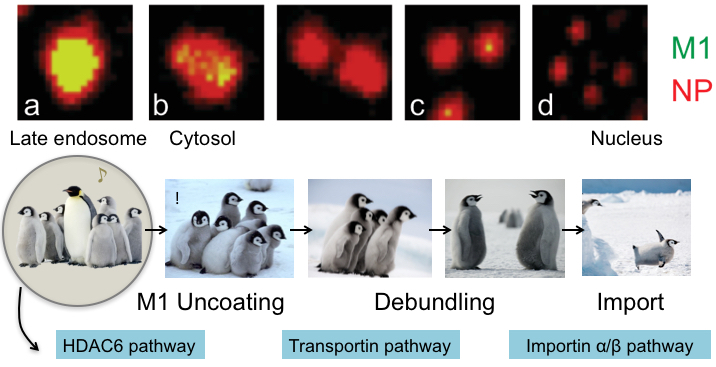 Ribonucleo-penguin debundling and import. Flu vRNPs are up to 110 nm in length and assume an ordered orientation in the virion, adopting a 7+1 arrangement with seven vRNPs surrounding a central vRNP. After fusion at the late endosome, HDAC6 disassembles the M1 shell, releasing vRNPs. TNPO1 removes residual M1 from the surface of vRNPs via a PY-NLS at the M1 N-terminus promoting vRNP debundling. Further, vRNPs are nuclear imported via the classical NLS pathway. To infect a new cell, flu virions endocytose into vesicles and travel inside the endocytic pathway until they reach the late endosome. At low pH the viral HA activates and fuses together the viral and late endosomal membranes. Histone deacetylase 6 and the aggresome processing machinery disassembles the M1 shell (Banerjee et al., 2014) allowing vRNPs to escape into the cytosol. vRNPs then undergo a debundling process which can take place on the surface of a late endosome as well as in the cytosol. As M1 is removed from vRNPs they decrease in size and are observed as homogenous spots in the nucleus that correspond to single vRNPs. We found that TNPO1 removes residual M1 from the vRNP surface and promotes debundling. TNPO1 binds to M1 by recognising a PY-NLS (Twyffels et a., 2014) at the M1 N-terminus. Following separation, individual vRNPs import into the nucleus by binding to importin α/β. Once you stop a virus dead in its tracks, it is easier to dissect mechanistically what is going on. Assay development is key in virus entry research and requires a lot of trial and error. Critical thinking, creativity, collaboration, and communication is also key. Flu is hard to work with compared to herpes simplex, a virus that I worked on for almost a decade before switching to flu. Flu dislikes genome manipulation, and this has so far limited the fields' options for live fluorescent imaging of incoming vRNPs or M1. Our study will shed light on recent studies that showed vRNPs transport to the nucleus as a bundle (Chou et al., 2012), or that they separate as they leave the endosomes (Qin et al., 2019). 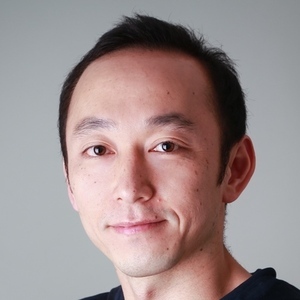 Miyake Y, et al. (2019) Influenza A virus uses transportin 1 for vRNP debundling during cell entry. Nat Microbiol. Chou YY, et al. 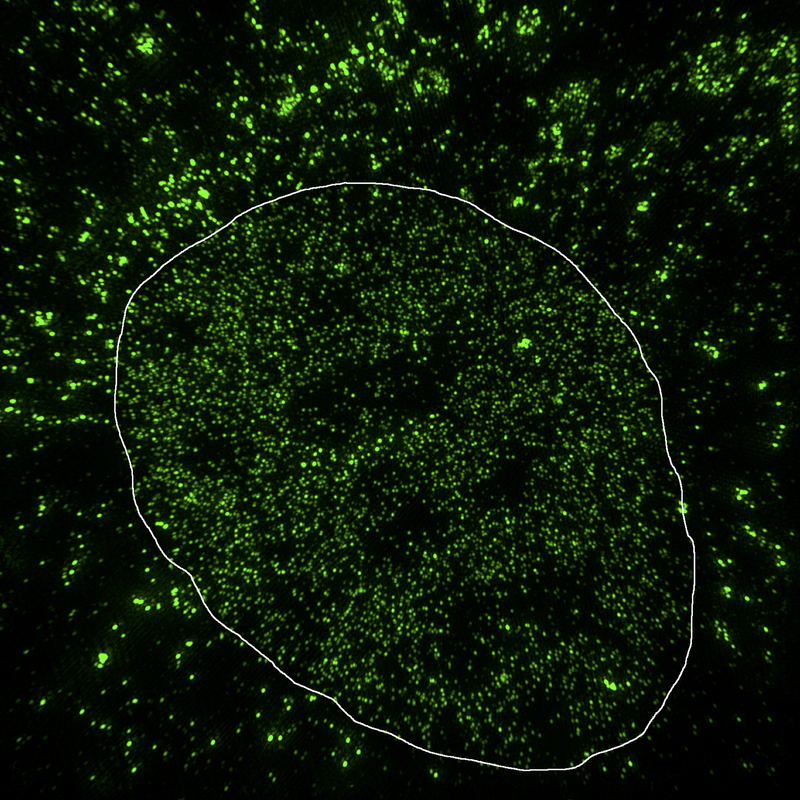 (2013) Colocalization of different influenza viral RNA segments in the cytoplasm before viral budding as shown by single-molecule sensitivity FISH analysis. PLoS Pathog 9:e1003358, and erratum (2013), 10.1371/annotation/8f53e7f2-2348-436f-b37e-a883a01e9bbd. Qin C, et al. (2019) Real-time dissection of dynamic uncoating of individual influenza viruses. Proc Natl Acad Sci USA, 10.1073/pnas.1812632116. Banerjee I, et al. (2014) Influenza A virus uses the aggresome processing machinery for host cell entry. Science 346:473–477. Twyffels L, et al. (2014) Transportin-1 and Transportin-2: protein nuclear import and beyond. FEBS Lett. 588(10):1857-68. 10.1016/j.febslet.2014.04.023. 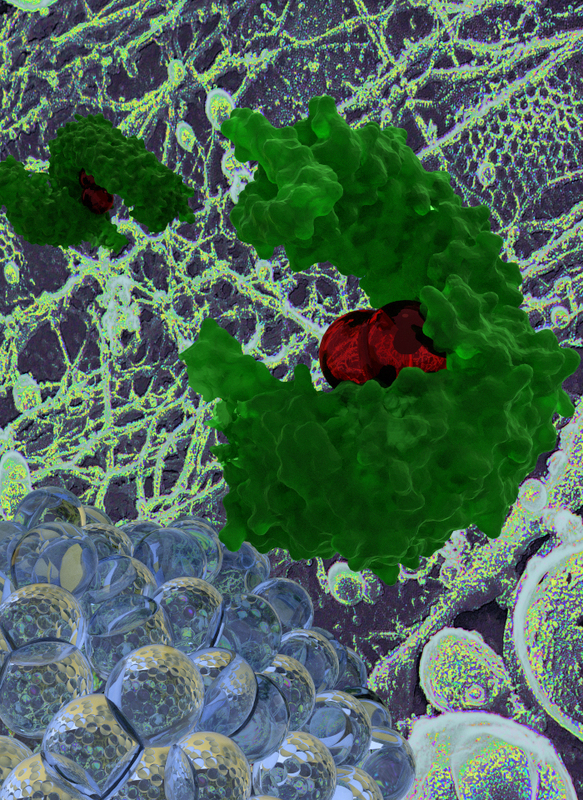 Structured illumination microscopy (SIM) image of incoming flu vRNPs. The nuclear spots indicate single vRNPs and are homogenous in size and brightness.